It’s no secret that walking on the city’s streets and sidewalks can be dangerous. With tons of steel whizzing past just inches from us, pedestrians in San Francisco are at significantly higher risk of injury and even death than the drivers and passengers inside those speeding vehicles. In fact, NHTSA data shows that pedestrian accidents in San Francisco represent over half of all traffic fatalities in the Bay Area. While it may seem that the responsibility for these accidents rest solely on the shoulders of the drivers involved, there are a number of things we can do as pedestrians to protect ourselves. Data collected by the NHTSA for 2013 (the last year for which complete statistics are available) shows that a pedestrian was injured every 8 minutes and one killed every two hours in America. In fact, pedestrian traffic deaths represent 14% of traffic fatalities across the country. In order to protect yourself from careless drivers while walking city streets, it’s important to know how and why the majority of these accidents occur. For example, you may think the majority of pedestrians are struck while crossing the street at intersections. However, such accidents represent just 20% of the total. In fact, 69% happen at non-intersections—especially along highways and arterials. Age also plays an important factor. 21% of children 14 and younger killed in traffic crashes were pedestrians, not passengers. On the other end of the spectrum, 19% of fatalities and 10% of those injured were 65 or older. All of this has made San Francisco streets actually safer than many in other urban areas across the country but there is still room for improvement. It’s great that the city is taking the initiative to protect its citizens but you can do even more. Avoid “High Injury Corridors” whenever possible. Plotting your daily route to avoid these dangerous stretches of road will significantly decrease your risk of being involved in a crash. Walk in the daylight hours—or properly arm yourself to walk at night. If you have to walk at dusk or after dark wear bright clothing, use reflective materials or blinking lights attached to your clothing, and carry a flashlight (or as mentioned above use the flashlight app on your cellphone). Walk as far away from the travel lane as possible. Use sidewalks when they’re available and keep off the streets. Walk facing traffic. Not only is it proper traffic etiquette, it could also save your life. Look both ways before entering or crossing the street. Take that extra second to make sure you’re safe and don’t count on drivers to stop for you! Keep young children and older individuals close. Make sure they understand the risk traffic poses. But sometimes all the preparation in the world can’t protect you from harm. If you have been injured by an automobile on city sidewalks or streets, contact an experienced San Francisco pedestrian accident attorney as soon as you can to discuss the legal options available to you. Get the legal help you need to get back on your feet fast. 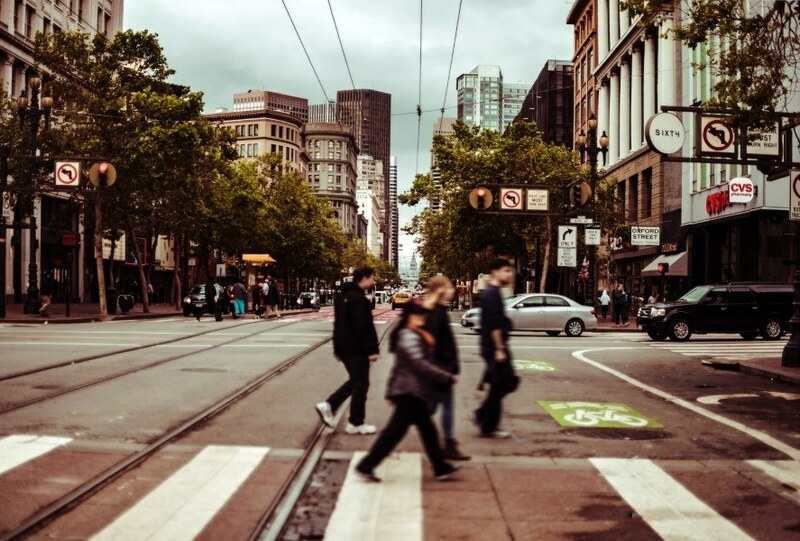 As a San Francisco personal injury attorney, I have handled a large number of pedestrian accident cases in San Francisco – many of them very serious and with great results for our clients. Our firm is a proud supporter and sponsor of Walk SF – a frontrunner in the Vision Zero project. We pride ourselves on being top notch pedestrian accident attorneys.